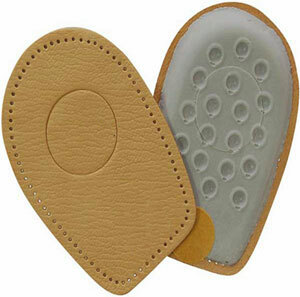 After years of pounding, your heel's natural cushioning fat pad flattens out, losing its shock-absorbing capability. The inflammation associated with plantar fasciitis can often lead to the formation of a heel spur, a calcium deposit on the heel bone that can cause severe pain. These leather covered latex heel cushions dissipate the shock impact of each step, while a removable insert creates a soft ring of protection around your heel spur, providing instant relief for painful heels.